Freeway entrance shield assembly for Business Loop I-80 located at the intersection of W Street and 15th Street (former California 160) in Sacramento. The on-ramp links the communities of Richmond Grove and Poverty Ridge with U.S. 50 west to I-5 and West Sacramento. Photo taken 03/13/15. 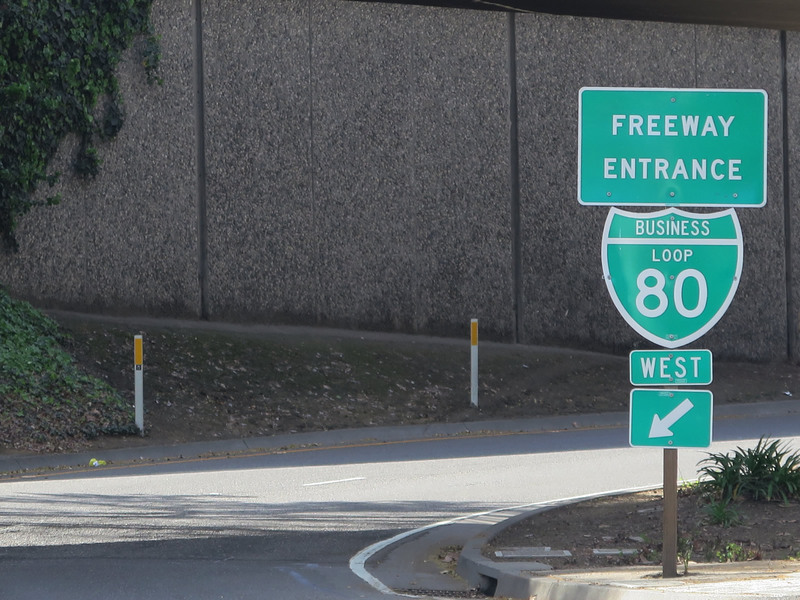 Following a portion of U.S. 50 and all SR 51, Business Loop I-80 in Sacramento is the Capital City Freeway. It connects to Interstate 80 in the city of West Sacramento and just outside the northeastern Sacramento city limits near Sacramento McClellan Airport (MCC). Business Loop I-80 was established in 1982 and renamed the Capital City Freeway in 1996. The western leg of the route is generally signed as U.S. 50 and doubles as unsigned Interstate 305. 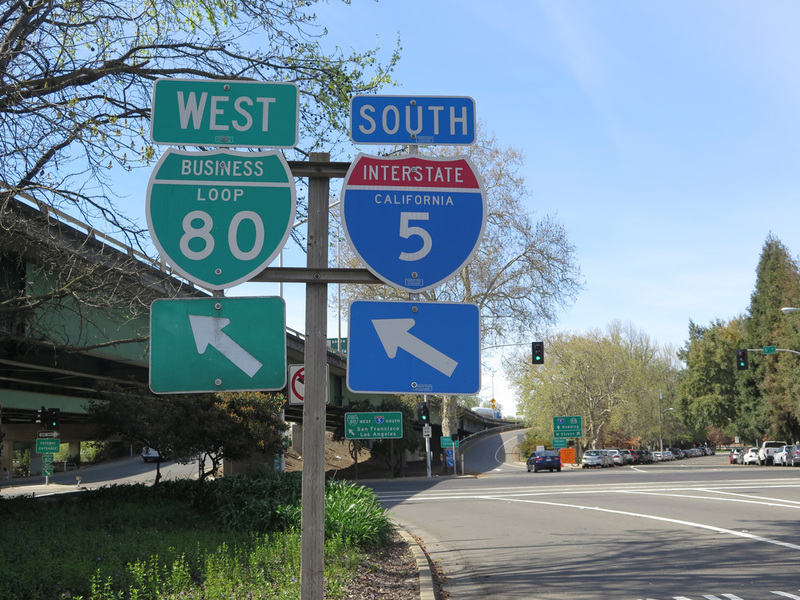 The remainder of the route northeast through Sacramento is unsigned SR 51.
the choice of Business 80 was made with the idea of making it easier to get into town (after all, it is posted as the exit for Sacramento at its termini)." A subsequent decision made by the Sacramento Area Council of Governments (SACOG) in 1996 named the entire Interstate Business Loop 80 freeway as the Capital City Freeway. This renaming arose in response to complaints from travelers who found it difficult to follow Business 80. This redesignation may have cost around $150,000, but this has not been substantiated. However, even with the new name, traffic reporters alternately refer to Business Loop I-80 by its numerical designation or by its Capital City Freeway name. However, most Sacramentans know what to call the business loop when giving directions to people from out of town. Prior to the Capital City Freeway designation, Business 80 had a host of names. One of the most famous peak-hour traffic bottlenecks is the S-curve around the Marconi exit, known as the "Marconi Curve." The two major viaduct sections near Downtown also have names: The "WX" is so named because the freeway overlays the block between W and X Streets (Caltrans references this as the Camellia City Viaduct), and the "29/30" is so named because the freeway overlays the block between 29th and 30th Streets. In addition to the colloquial names listed (WX or Camellia City Viaduct and 29/30 Viaduct), the business loop was also known as the West Sacramento Freeway between I-80 west and Interstate 5, as the North Sacramento Freeway between SR 160 and the Marconi Curve, and as the Roseville Freeway between Marconi Curve and I-80 east. The SR 51 portion also shows on some maps as the Elvas Freeway south of SR 160, and on older maps as the State Freeway between SR 160 and I-80/SR 244 outside the Sacremento city limits. Westbound W Street at 5th Street and the freeway on-ramp for Business Loop I-080 & U.S. 50 in the Southside Park community of Sacramento. Business Loop I-80 connects with I-5 south to Los Angeles while a direct ramp links W Street with I-5 north to Redding. Photo taken 03/13/15. The Camellia City Viaduct Rehabilitation project rebuilt the 1968-built viaduct along the WX Freeway with wider shoulders, improved lighting and extended the service life of the structure for 20 years. The $46.2 million project was underway in 2014. SR 51 Preliminary Investigation: A development plan is currently being prepared that is identifying and prioritizing needed TOS and ITS improvement projects along SR 51 from US 50 to I-80, including ITS, bus/carpool and auxiliary lanes, and widening of the American River Bridge. The plan will include a project delivery phasing plan that identifies and prioritizes capital projects. Once the plan is completed, the highest priority projects will be pursued based on funding availability. Originally what is now Business Loop I-80 was signed and designated as Interstate 80. Interstate 80 made its first appearance in Sacramento around 1964, following the concurrent section of U.S. 40 and U.S. 99E and a portion of U.S. 99E across the American River into Downtown Sacramento. The Interstate 880 bypass around the north side of Sacramento was already planned at this time. The Interstate 80 freeway through Sacramento carried California State Legislative Route Number 80 on the state highway system. The ensuing years resulted in a plan by what is now called Caltrans to bypass the existing Interstate 80 through northeast Sacramento with a new 5.1-mile alignment parallel to the existing freeway was put forward. The bypass was needed because the existing Interstate 80 alignment did not meet Interstate standards, and many of the substandard elements are still evident today on the Business Loop I-80 freeway northeast of the American River crossing. The new I-80 alignment was to start within the median of Interstate 880 from the 80/880 junction northeast of Sacramento in a dual freeway design. It would then separate onto an alignment running along side the Southern Pacific Railroad mainline all the way to where it would rejoin the old Interstate 80 freeway just south of the American River. South from the river to Downtown, another dual freeway design was envisioned. The "FAU 6380" designation was used for the old alignment while the new alignment remained on the books during the 1960s and 1970s. It is doubtful that FAU 6380 was ever planned to become Interstate 380, since I-380 in San Francisco was established in 1969 and the old alignment did not meet Interstate standards. Construction was well underway on Interstate 880, the northern bypass of Sacramento, in 1969. The dual freeway design at the east end of Interstate 880 was part of its construction. The I-880 bypass was finished by 1972, and the portion of the new Interstate 80 alignment within the I-880 median was completed but not opened to traffic. It ended at a long bridge dead ending beyond the railroad line and Roseville Road. Numerous problems hindered completion of the new alignment. During the 1970s, Northern California Interstate construction and planning proceeded, albeit with many changes along the way. It was at this time that the proposed Interstate 80 realignment was modified. The Sacramento City Council, in a historic first, voted in 1979 to delete the new 5.1-mile alignment, formally between C Street and the interchange with I-80 and SR 244, and use the funding and right-of-way for a rail transit system. Prior to 1979, no other city had ever done this. This eventually led to the repurposing the right-of-way reserved for Interstate 80 for use by Sacramento's light rail system. The new Interstate 80 alignment was withdrawn from the Interstate system in 1980.1 Subsequent actions by FHWA and AASHTO renumbered the I-880 bypass of Sacramento as the new alignment of I-80, and the western segment of old I-80 as unsigned I-305 (FAI 305). The remainder of the original I-80 was classified as FAP Route 51. State Senate Bill 191 reclassified all of the respective routes at the state level in 1981. Sign changes followed in 1982, with I-880 replaced with I-80 and Business Loop I-80 signed throughout West Sacramento and Sacramento. The original business route for I-80 along West Capitol Avenue (former U.S. 40/99W) in West Sacramento was deleted to avoid confusion. Interstate 880 was reassigned to the Nimitz Freeway in the San Francisco Bay with approval by AASHTO in 1983 and the passage of State Assembly Bill 2741 in 1984. Meanwhile in Sacramento, the RT Metro light rail began service in 1987. The light rail service uses the completed portion of the attempted I-80 realignment along with much of the old right-of-way. This freeway entrance shield assembly is posted at the on-ramp from eastbound X Street onto U.S. 50 and Business Loop I-80 east from 16th Street in Sacramento. Photo taken 03/13/15. Caltrans developed plans in 1998 to construct HOV lanes on the 29/30th portion of Business Loop I-80. 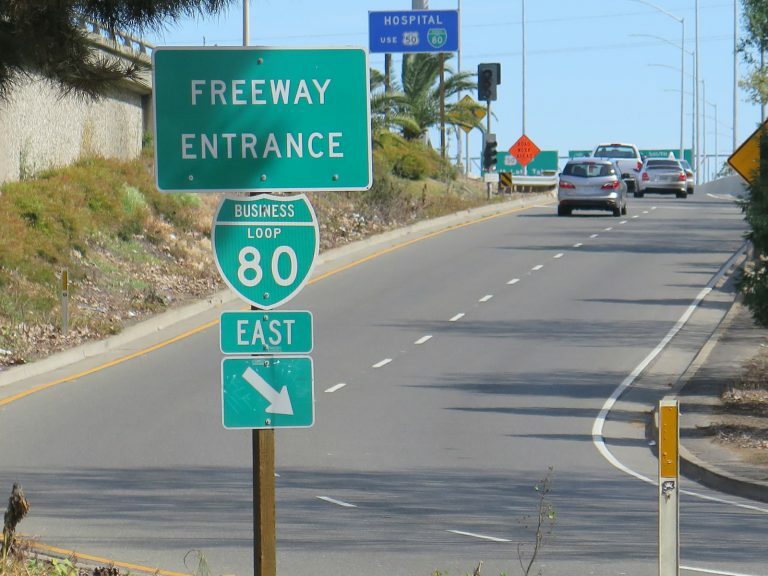 Forming a 15 mile system of continuous HOV lanes, they begin near E Street and continue southward onto California 99 to link with the existing California 99 HOV lanes. Completed in 1999, Caltrans added HOV lanes to those viaducts by repaving and restriping the lanes. Signage for SR 99 was removed from its concurrent sections with Business Loop I-80 and Interstate 5 in 2000. Overhead signs were altered to read "To SR 99." This was done in conjunction with a series of improvement projects on Interstate 5. The rationale for the sign changes was because of the significant break in SR 99 between the exchange with U.S. 50 and SR 51 at the Oak Park Interchange and where it separates with I-5 north of Sacramento. Trailblazers for I-5, Business Loop I-80 and SR 99 at 5th and P Streets in Sacramento. Photo taken 04/10/01. Button copy signs precede the ramps to Interstate 5-SR 99 and Business Loop I-80-U.S. 50 at the west end of P Street. Photo taken 04/10/01. 5th Street north at the on-ramp for both Business Loop I-80-U.S. 50 west and Interstate 5 south in Sacramento. Photo taken 01/08/02. W Street parallels the north side of the Capital City Freeway between California 99 and Interstate 5. Trailblazers for both routes stand along W Street beside the WX Freeway and Southside Park after 8th Street. Photo taken 01/08/02. W Street partitions with freeway ramps for Interstate 5 south, Business Loop I-80 & U.S. 50 west and I-5 & SR 99 north at 5th Street. W Street extends another two blocks to end at 3rd Street. Photo taken 01/08/02. X Street runs along the south side of the Camellia City Viaduct as the eastbound frontage street for Business Loop I-80 and U.S. 50. The second of three on-ramps to U.S. 50 east departs from X Street at 16th Street here. Photo taken 2002. 29th Street forms the west side frontage street for the Capital City Freeway south from C Street. The first in a series of on-ramps to Business Loop I-80 west joins the freeway from 29th and H Streets. This guide sign was replaced in 2015, with Business Loop I-80 and SR 99 switching places. Photo taken 07/27/12. Overlaying half diamond interchanges join Business Loop I-80 (SR 51) with N and P Streets between the Midtown and East Sacramento neighborhoods of the capital city. A two-lane ramp departs from 29th Street south for the freeway leading to U.S. 50 and SR 99. Photo taken 07/27/12. Traffic merging onto Business Loop I-80 west from 29th and N Streets encounters a weaving traffic pattern over the ensuing 0.4 miles to the systems interchange with U.S. 50. Photo taken 07/27/12. A trailblazer directs motorists onto 29th Street south from T Street west below the 29th-30th Freeway viaduct. An on-ramp otherwise leads directly to the continuation of California 99 south from the Capital City Freeway. Photo taken 04/08/01. Prior to 2011, these trailblazers for Business Loop I-80, U.S. 50 and SR 99 were posted at the intersection of 59th Street north at T Street. Photo taken 04/08/01. The on-ramp from Tribute Road north to the North Sacramento Freeway east references Business Loop I-80 instead of SR 160. SR 160 concludes at an adjacent wye interchange with the Capital City Freeway eastbound. Photos taken 03/29/01. All traffic to Business Loop I-80 from Arden Way westbound departs in unison from the arterial by Arden Fair mall. The on-ramp separated beyond this guide sign, which was subsequently replaced and ultimately removed in 2017. Photo taken 01/08/02. Substandard ramps connect the eastbound roadway of Business Loop I-80 & SR 51 with the north end of Howe Avenue at Auburn Boulevard (old U.S. 40). Photos taken 09/10/05. A wye interchange connects Auburn Boulevard with adjacent Business Loop I-80 westbound after Watt Avenue. Photo taken 09/18/00. Watt Avenue leads south from a parclo interchange with Interstate 80 to meet Business Loop I-80 west beyond Longview Drive. Photo taken 09/18/00. The Dwight D. Eisenhower System of Interstate and Defense Highways: Part V - Interstate Withdrawal-Substitution Program: Withdrawal of I-80 -- Sacramento, California.